The fire known as Parry Sound 33 has burned more than 100 square kilometres. Sheleigh Knight, her father Ron Joll and dog Crawford prepare to leave Flat Rapids Camp and Resort, along the French River near Killarney, Ont. under forced evacuation orders due to forest fires burning about four kilometres away on Tuesday. KILLARNEY, Ont. — While heavy grey smoke from a nearby forest fire hung in the air, Donna Butson packed a bag of clothes and walked in her backyard with tears running down her face. 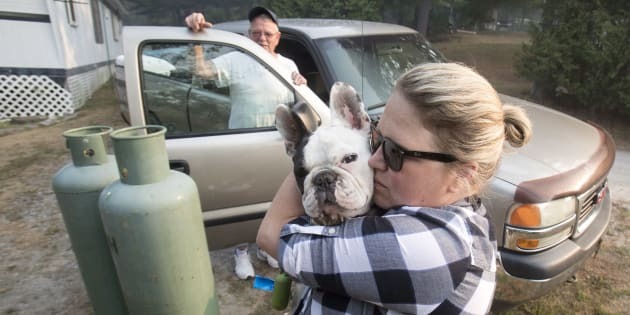 She is one of many residents who had to leave their homes Tuesday due to the raging fire known as Parry Sound 33 burning in northeastern Ontario. "I lost my husband three years ago and he is everywhere here," she said as she looked around her property in Killarney, Ont. "When I don't have this, I lose a lot more than the buildings." Parry Sound 33 started on July 18 and has now burned more than 100 square kilometres, said Jonathan Scott, spokesman for the Ontario's Ministry of Natural Resources. The blaze is currently only five kilometres from the Trans-Canada Highway and will likely spread out more in the next days as the weather stays dry and windy, he said. The ministry said there are more than 500 firefighters battling the fire, and more than 200 of them are from Mexico. "Each crew is assigned a team leader who is bilingual and relays orders," Scott said. "So far, it's been going really well and everyone is working really well together to suppress this fire." The French River, near Killarney, Ont., is shrouded in smoke from an active forest fire nearby on Tuesday. In Killarney, like elsewhere, the municipal government had to issue an evacuation order for certain areas, instructing residents to take three day's worth of clothing, food and water with them. Gordon Fraser, who moved to Killarney about a year ago, was also leaving Tuesday morning. He said he was going to stay with his daughter and her husband in Sudbury, Ont., located about 100 kilometres to the north. "Of course I am worried about my property," Fraser said, wiping tears off from his eyes. "But we are not hungry and we are dry and safe ... so what can you do?" While some left their homes behind, others had to end their vacations early. A firefighting helicopter lifts off from the command centre and base camp in Britt, Ont. on Tuesday. Rob Joll, owner of the Flat Rapids Camp and Resort in Killarney, said he and the holiday-makers in the area were also forced to evacuate. On Tuesday morning, he packed up some of his belongings, leaving behind about a hundred of vacant cottages and trailers. "It is so disappointing for the people that are here on summer vacation, especially with the long weekend ahead of us," he said. "For me, it is a revenue lost because I can't rent cottages,"he said. "My only hope is that when we come back, there will be something to come back to." In French River, Ont., — east of Killarney — an evacuation alert has been issued by the municipal government, warning residents in some areas that they should be prepared to leave at a moment's notice. Some of the residents said they already have bags waiting by the front door, packed with photographs, important documents and a few clothes. But they said they are hopeful they won't have to leave. "It's a waiting game," said Jack Bearman, who has been living in the area for about 30 years. "You just have to hope you don't go up in flames." Bearman owns the French River Inn Motel, located just off Highway 69, where the smoke from the fire is creeping in. He said this time of the season is usually the busiest of the year. But now, the rooms and the dining hall are empty. The workers are looking out the window at the smoke that's spreading rapidly. Smoke blankets the area as Ministry of Natural Resources firefighters work a boat at Flat Rapids Camp and Resort on the French River near Killarney, Ont., on Tuesday. "I've seen fires before, but never anything like this," said Bearman. He said he will be staying at his motel as long as he can, but "if it's too bad," he said go to his hometown of Hamilton. "But honestly, I don't think we will have to leave," he said. "At least, I hope we won't have to." Debbie Nadeau, who works in the kitchen at a business off Highway 69 in French River, said she is worried but is staying positive. "What else can you do?" Nadeau asked. "Of course we are worried like everyone else, but we love our job and we love this place, so we will stay open as long as we can."